University of New Mexico Computer Science Professor Melanie Moses is leading a national competition to teach students to program small robots to swarm. Working together, UNM and NASA built 55 Swarmie robots. Schools across the country received 36 of the robots. The rest were used for testing or will be part of the competition scheduled for this weekend. Faculty and students will travel to the Kennedy Space Center on April 21-22 to participate in the physical robotics portion of the Swarmathon Competition. About 100 of the more than 500 students from 36 minority-serving institutions plan to attend. Teams from Central New Mexico Community College (CNM), Southwest Indian Polytechnic Institute (SIPI) and Navajo Tech in Crownpoint, N.M. are competing. Twelve teams developed search algorithms for the small robots that operate autonomously. The robots are programmed to communicate and interact as a collective swarm. Moses developed the idea of programming the Swarmies after studying the way ants interacted as they foraged for food. During the competition, the algorithms developed by the teams will run on the Swarmies in an official competition arena. Groups will be ranked by the number of resources their search algorithm is able to locate during a specific period of time. 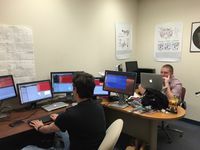 The Swarmathon challenges students to develop algorithms in software, and integrate their code into robotic platforms that could revolutionize space exploration by collectively collecting extraplanetary resources. Robots have to identify resources scattered across an arena and return them to a collection zone. UNM graduate students work on code in computer lab. This week, NASA is testing the teams' code on physical robots at the Kennedy Space Center Visitor Complex. Simultaneously, UNM is competing with student code in the Virtual Competition where teams' program robots in a simulated environment. Winners of the Physical and Virtual competitions will be awarded prizes of up to $5,000 at Kennedy on April 21. NASA said this competition is a project is part of the Minority University Research Program, which strives to ensure that underrepresented and underserved students participate in NASA education and research. It says as humans expand their presence in the solar system, the goal of the Swarmathon competition is to develop integrated robotic platforms that could revolutionize space exploration.